Heather Heft concentrates her intellectual property practice on all aspects of trademark, copyright and unfair competition law, including domestic and international counseling, clearance, filing, prosecution, protection and enforcement. She also counsels on internet, advertising, social media, and related matters. 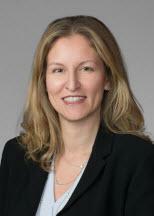 She advises on intellectual property rights enforcement, including Trademark Trial and Appeal Board proceedings, domain name disputes and Federal Court litigation. In addition, Ms. Heft counsels on the exploitation of proprietary rights in the United States and abroad, including negotiating and drafting a wide variety of contracts and licenses. Her expertise also includes conducting intellectual property due diligence for corporate transactions, and related worldwide assignment, merger and name change filings. Ms. Heft has spent her career advising a range of clients, from Fortune 100 companies to independent entrepreneurs. Her experience is wide reaching – she has worked on abdominal pharmaceuticals to zirconia jewelry, and everything in between. Ms. Heft was previously a partner in a boutique, woman-owned intellectual property firm and has more than a decade of experience in the intellectual property department of a national law firm.